Will the Apple iPhone 7 feature this game changing technology? 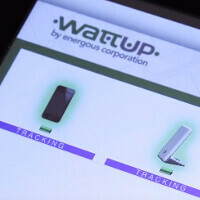 According to a report published today, a small start-up company named Energous has shaken hands with Apple to bring its WattUp technology to the iPhone. Reportedly, Apple will have the exclusive rights to the technology, which allows devices to be charged wirelessly from distances as far away as 15 feet. The Energous chip is added inside a device and is so small that it won't affect the size of the phone. The chip works with a transmitter that can be placed anywhere in a room. In other words, if the WattUp chip is placed inside the Apple iPhone 7, and you put a transmitter inside your office, your phone will spend most of the day charging. If you put a transmitter in your bedroom, it will charge wirelessly all night and even in the morning while you get dressed for work or school. If Apple has the exclusive for WattUp, it will also allow the company to garner a new source of revenue by selling the transmitters to those with WattUp enabled iPhones. Energous has previously targeted 2016 or 2017 for the commercial launch of its product. If it is not included in the iPhone 7, it just might be found in the Apple iPhone 7s. We should point out that neither Apple nor Energous have publicly disclosed that there is a partnership between them, which means that talk of an Apple exclusive is just that, talk. Louis Basenese of Disruptive Tech Research is the one who has found some evidence that Apple is involved with Energous. Early last year, the company signed a pact with an unnamed company described as being one of the top five consumer electronics firms in the world. Basenese used a process of elimination to come up with Apple as the unnamed company. He starts with a list of the five possible candidates, Apple, Samsung, HP, Microsoft, and Hitachi. Whoever ends up with the technology, WattUp could be the thing that revives global smartphone sales in the neat future. I'm wondering what the frequency of the electromagnetic wave will be, the radioactivity and it's effect on the body. If it is strong enough to induce current from that short distance then it's probably not that intense, hopefully. Which means that it will probably charge pretty slow. Nonetheless, it will constantly be charging wireless which is very convenient. Is it possible that the device will stop charging itself when it reaches 100% (you know, like it does with the cord), and maybe automatically wait till it's at 95% to start again (so it's not consistently recharging that 0.01%)? Well change my post to charge to 80% and stop... W/E, just calibrate automatic start stop to best optimize the life of the battery - either way - THIS is the wireless charging I was waiting for, not the toothbrush technology. Nice of you to have been waiting, but in the mean time I enjoyed the 'wireless' charging. Who cares if it's toothbrush tech, MagSafe is a slow cooker and fondue pot tech, doesn't mean it wasn't a great thing when Apple used it. Of course long distance wireless charging is easier than inductive charging, that's where evolution of tech comes along. Doesn't mean we have to diss older or current tech. Oh I don't know, I think it's perfectly fine to diss old/current tech if it's just a gimmick. Marketing s**t as wireless, making it seem as if it would make s**t more convenient when all it does is root you to a single spot. So one night you're laying in bed, and you wanna use your phone, laying down comfortably, but it's low on power, and has to mate with it's damn dock which is stationary as fcuk. Yup perfectly fine. There are downside to inductive charging, true. But just have spots where you usually are (in my case, nightstand, work desk, personal desk and sidelamp) and leave it on there, keeping it charged between 40 and 80% is added comfort For me that beats connecting a cable to it. That doesn't mean I don't welcome longer distance charging. Still need multiple spots, but it does charge when you are using it, making it even more convenient. I think it's just the opposite... the lithium batteries last longer if you keep it charged. Google it. Don't forget about charging cycles for batteries. It will be dead faster. A battery has a limited number of charging cycles before it gets worse. But those numbers are full charging cycles, charging it often between 40 and 80, don't account for a full charging cycle. So that doesn't impact the battery life more than full charging cycles. Anything is possible, with great precision too. Just look at the video, it can start/stop charging with the touch of a "switch" in the app. It does look great and a lot of stuff that is manageable, also rules out any issues over full charging and wearing out the battery. It would be a shame if they would decide to be exclusive to Apple, the entire smartphone industry should benefit from a tech like this. Looking at the screens, they did develop this with all platforms in mind. Wire free! Now that's the real wireless charging I'm so looking forward to. So what are we gonna call it, if inductive charging is called wireless already? LoL, it was stupid when they called it Retina Flash. But u do know that others will follow this REAL wireless charging, what then? It's not like others aren't in the process of developing this tech either. There are multiple version of real wireless charging. It's called evolution of tech. Not only Apple will be buying this. They just make the headlines more. Because it's easier to wait for others to develop the technology, witness their failure to push it out to the market, and learn from that. Then take the technology at little to no R&D cost, focus on repackaging and it push it out with near guaranteed success. Then sit on an even larger pile of cash. Innovation does not equal Invention. Apple is an innovative company. Sony is an inventive company. Well said. Apple thinks Samsung stole its technology. But the truth is Samsung only "stole" the iphone's exterior design, not the technology within it. It is really Apple that steals technology from Windows Phone and Android phones. "Also explain why Note 4 struggles to run RR3 with missing polygons and framerate dropping in minutes, but I can run it smoothly all day long on iPhone5s (not to mention 6s)? " No such problem on my old Exynos Note 4 (many hours of fun) at native resolution, let alone 1080P (choice=key), but with less than 5 times the pixel, it'd be a travesty if that 5S couldn't run RR3 without issues.